Following the disastrous Scoured Stars Incident, the Starfinder Society fights to remain relevant as the rest of the galaxy moves on. With surviving agents stretched to their limits, the First Seeker launches a desperate bid to search the false moon of Salvation's End. Will the mission reveal a discovery that can stabilize the Society long enough for a new generation of Starfinders to come to the fore? Players use 4th-level versions of the Starfinder iconic characters in this debut special event of the Starfinder Society Roleplaying Guild. Note: Due to the special nature of this product, it is NOT part of the Starfinder Society Scenario Subscription. This adventure has some great supplementary rules notes and cheat sheets included within it for ease of play, which is a really awesome addition (particularly since it's one of the first scenarios that came out). This adventure is really fun, and has a cast of colourful characters, both allies and enemies, which are a blast to interact with. The starship battle in this adventure is really unique and kooky. Plus, it’s got goblins in it! Who doesn’t want to see goblins in space?!? Despite that this was a really fun adventure, there are two major downsides for me. The first, is that you need to use pre-generated characters if you’re playing it in the Starfiner Society. Some of us don't mind pre-gens, but frankly, I don't like using them. Second, you’re only exploring the surface of Salvation and determining if the site is worth further exploration. which means that when you reach the end of this scenario you might feel like its unfinished. (Although the story of Salvation's End continues in other adventures, which I do love). Although I’m definitely going to use this scenario with my family as part of an ongoing campaign, I’m not going to play it in the Starfinder Society. Pre-generated characters aren’t really my thing. I'd bump the rating up to four stars if you enjoy using pre-gens. I got the opportunity to run and then play this scenario over the last few weeks. When I ran it, I had a blast. It took about 2.5 hours to go through with a 3 person + NPC pregen group. While there were some typos and other mistakes that I had to correct for, everything went pretty smoothly and I think my group had fun with Obo, Keskodai, Iseph, and Navasi as the NPC. I had the most fun as the GM roleplaying the warden and Livewire in the early parts of the scenario. And singing the Goblin Song was inspired. I then got to play it with a mixed group of 5. I played Keskodai and we also had Iseph, Quig, Altronus, and Raia. While I enjoyed it, it ran a lot longer. The block text took forever to listen through as a player. The GM didn't notice the typo about the number of Goblin Junkers and the starship combat took forever against 4 opponents. It didn't help that 2 of the players were new and the other 2 of them were playing starship combat roles they don't normally take. I also got the feeling my GM really didn't like starship combat. By the time we got to Salvation's End, we were almost 4 hours into the scenario and all exhausted. It took 6+ hours total to finish. I still had fun, but it was getting frustrating by the end. I'd recommend running this for a smaller group if you're going to run it. The 4 player adjustment makes the starship combat very fast and smooth. It's also a lot less work. Try to put breaks in the block text and really play up the characters. The session is fun and a little quirky with the encounters. I personally found the scenario quite short and felt like there should of been a second part. This was a fun one. I actually enjoyed an adventure with pregens and thats not easy. The prison set up added a lot of atmosphere to the adventure and the world, and I was really invested in the mystery of whats in the redacted and the redacted in the redacted. And I almost died laughing at the most annoying radio broadcast ever. One minor nitpick, Yasoki shouldn't sweat. Sweating is a human thing and really doesn't work too well with giant coat of fur. Rats use their tail for that. Though this has to do with the DM and the group of players, of course, this was my favorite adventure. Woot! Cant' wait to play! Given that this is marked as unavailable: what will be the requirements to run this? I second Magabeus's question. I'd like to use this as the first Starfinder scenario my venue runs since it's specifically pregens, but it will depend on when it will be available and to who. From what I read in the starfinder forums: no requirements, single table. So how can you get your hands on this? It's apparently not included in the subscription. Also, Will it be replayable? I haven't found anything about the availability just yet, but this will premiere at GenCon, so it won't be until then. (I believe the goal is to have it available to run as soon as GenCon starts, for those who cannot attend.) It also isn't replayable. 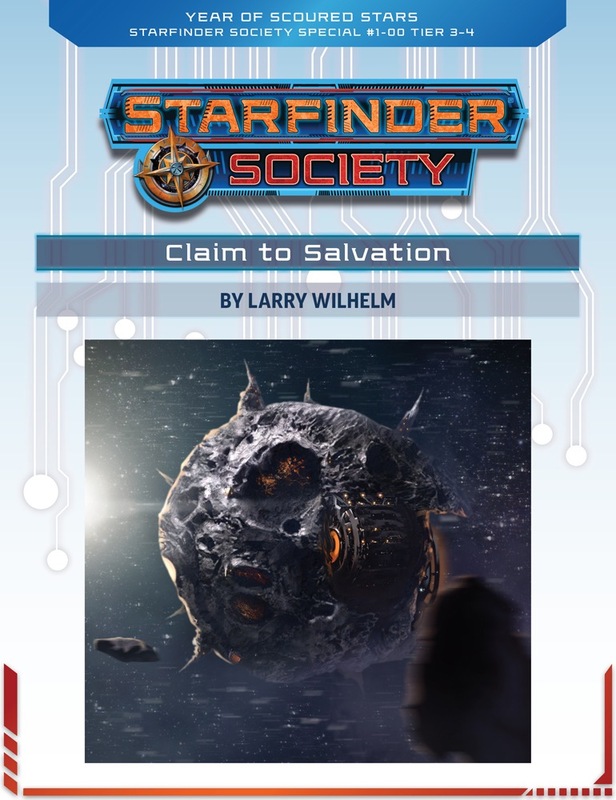 Thursday evening is the premier of the Starfinder Society Special #1-00: Claim to Salvation. This event uses 4th level versions of the Starfinder iconic characters, which James Sutter and the Starfinder team is currently previewing Friday's on this blog. The in-world Starfinder Society needs firepower to complete a mission and turn to the iconics to provide assistance. After Thursday evening's launch, the Gen Con schedule includes tables of this event most slots. The schedule is set up so that an attendee may play Starfinder all Thursday with pregenerated characters, pick up a copy of the Starfinder Core Rulebook from the Paizo booth in the Exhibition Hall, then make their own character and return Friday ready to play Starfinder Society Scenarios #1-01: The Commencement, #1-02: Fugitive on the Red Planet, and #1-03: Yesteryear's Truth. Of these offerings, #1-01 is a replayable scenario and #1-02 and #1-03 are for 1st to 4th level characters. Product pages are not yet available on paizo.com, but will be posted soon. I'm confused as to why it's not (apparently) part of the subscription. Probably because it's a special. I think the pathfinder society specials are also not part of the pathfinder society subscription. It's also not available to preorder. I guess what I'm trying to figure out is what scenario I'm supposed to tell my group we'll be starting with. Both this one and #1-01 have the "introductory scenario" theme. Is there any word on whether this will be available to run when the other Scenarios go live on the 17th? Still wondering when this will be available. This will be available for purchase and be good to run on the 17th. Great! I was really hoping to run this on release weekend! Am I correct to assume subscriptions and pseudo-subscriptions for Stafinder Superscribers will be filled on the 17th then, too? Thank you John, you have assuaged my scheduling concerns! Well it does say "will be available today"
Surprised they are not up yet. Maybe they have to wait for someone to throw the switch after they open today? Figured they would be in my downloads when I woke up today. Welp, someone input 12:00 PM instead of 12:00 AM, and it definitely was me. All good to grab PDFs now, sorry folks! Did, Nada. Now it's giving me the option to add to cart. D'oh, kicked much more forcefully this time. Should be all set now. Please don't be mad, oh glittery roomba overlord. OOOH, I see, we're talking about 2 different things here. Please see my post here, RE: Roleplaying Guild Subscription PDFs. Just read through--looks great! Can't wait until Saturday night . . .
Where do we find the pregens? I don't see them with the Pathfinder Society pregens and all the Starfinder Society links go the Pathfinder page. We're still in the process of applying a lot of updates to the Organized Play pages, but you can find them for download here. It might be helpful to add the usual banner to the description at at the top that this product is not part of the Starfinder Society Scenario Subscription. Because it's a Special. Those aren't included in Subscriptions is my understanding. Right, it's just kind of odd it wouldn't be included. Aren't the point of subscriptions to ensure you get all of the releases for whatever the topic/product is? Right, and you do, except for the Specials, which are an incentive to go to Cons. Not for nothing, but the only incentive to subscribe to "everything" is to get the scenarios. 3rd party sites sell everything for cheaper. Since I can buy this rightr now for $4.99, the Con incentive is false. It is just being nickel-and-dimed. Almost. The number of exceptions is pretty minimal but from time to time there are products not covered - I don't know much about organised play, but the other lines it tends to be things that fall outside "usual" products (this isn't a typical scenario within the usual story, as I understand things but rather a kind of "prequel" adventure). . I suspect it might also be so they don't seem to be "tricking" people into buying something beyond what was promised. The blogs are a good place to keep an eye out for this kind of thing. 3p sites do not sell the scenarios. And if you go to the Cons you get the Special early, and for free (not quite sure for that one). The product description has been updated with clarification that this is not part of any subscription. This decision models the structure of the Pathfinder Society Roleplaying Guild Scenario subscription, which means it only includes a seasons regular scenario releases. Specials are typically longer in length, designed for event play, and do not release to the general public as seasons begin (this makes release via a subscription sub-optimal, as they'd release out of order for a typical subscriber, or to a pool of GMs and VOs before subscribers gain access). An exception was made to make this particular product available for general purchase on the onset as this is a brand new campaign. I hope this helps explain things! This is just an omnibus of the separately available 1-01 thru 1-03 scenarios, yes? Nope. It's its own adventure. I came upon this in a "see also" section of one of those scenario's store pages. Where is information regarding the release of all SFS materials published? No, I mean a blog or somewhere that new material is announced. The store works just fine though, I suppose. Nice proper use of apostrophes, btw.